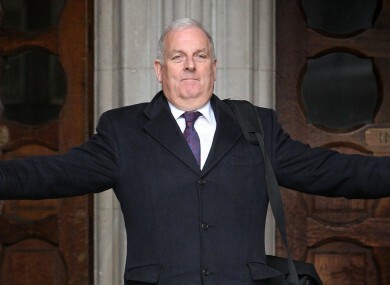 Kelvin MacKenzie leaves the High Court after giving evidence to the Leveson enquiry in 2012. THE SUN NEWSPAPER has suspended columnist Kelvin MacKenzie over a piece he wrote about Everton midfielder Ross Barkley. The footballer was punched in a bar in Liverpool city centre last week and in the column, which was about this incident, MacKenzie said he was not surprised and called him “thick”. He also compared Barkley, whose grandfather was born in Nigeria, to a gorilla. And he claimed men with similar pay packets in Liverpool were “drug dealers”. The article, which included side-by-side images of Barkley and a gorilla, has been removed from the paper’s website. Merseyside Police are investigating whether his comments constitute a ‘racial hate crime’ after they were reported by Liverpool’s mayor. #Breaking Kelvin MacKenzie says he did not know of Ross Barkley's family background, adding "beyond parody" to describe column as "racist"
In a statement, The Sun apologised for offence caused and said it was “unaware of Ross Barkley’s heritage”. It also said the views expressed by the columnist about the people of Liverpool, were “wrong, unfunny and are not the view of the paper”. The Sun said MacKenzie is currently on holiday but that the matter would be fully investigated on his return. Email “Sun suspends Kelvin MacKenzie over 'unfunny' Ross Barkley column”. Feedback on “Sun suspends Kelvin MacKenzie over 'unfunny' Ross Barkley column”.